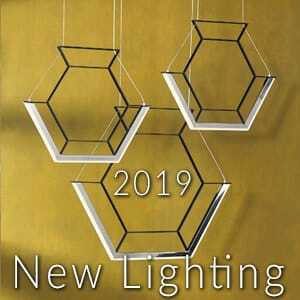 We’re only in the early stages of 2019 and yet we’ve already seen some stunning new introductions to our range of lights. Let us highlight a few of these bright new showcases for you here, from the multi-functional and geometrically styled to the fun and quirky. Looking for something to fill you with wonder? Something with a futuristic feel and contemporary style? The Mercury range clearly takes inspiration from further afield with an aesthetic reminiscent of astral geometry. These fittings use LED technology within the ring like structure which surround a polished chrome sphere to reflect the light, this is suspended on a thin wire to give the illusion of it floating. 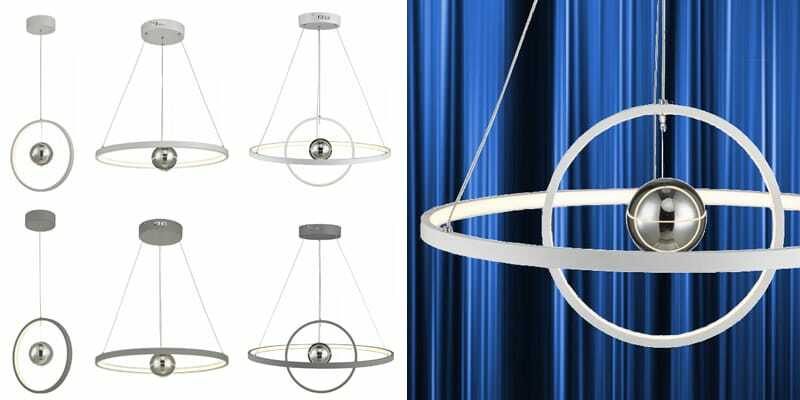 The Mercury range comes in a grey or white finish and is available as a single vertical ring pendant, single horizontal ring pendant or a combination of both in the dual ring pendant. 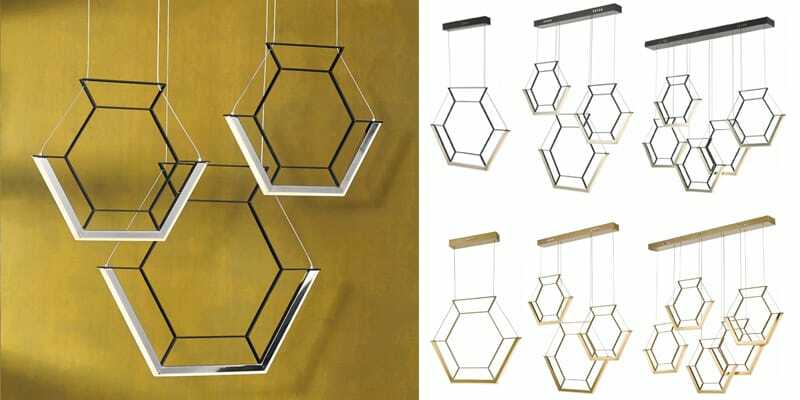 Below is the intriguing and structurally pleasing Hexagon range. With a clean unobtrusive design this sleek range houses a discreet LED light source on the underside providing a warm lighting effect. Available in a finish of either black or gold and available as a single, three or five light the options here are plentiful. 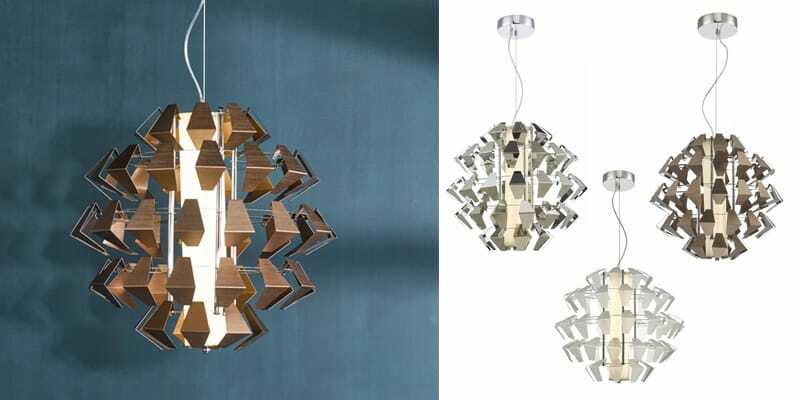 An excellent choice for an over table light or kitchen island light in a residential setting and a suitable option as a subtle divider for sections of a restaurant. Why not add a little fun and quirky character to your interior? 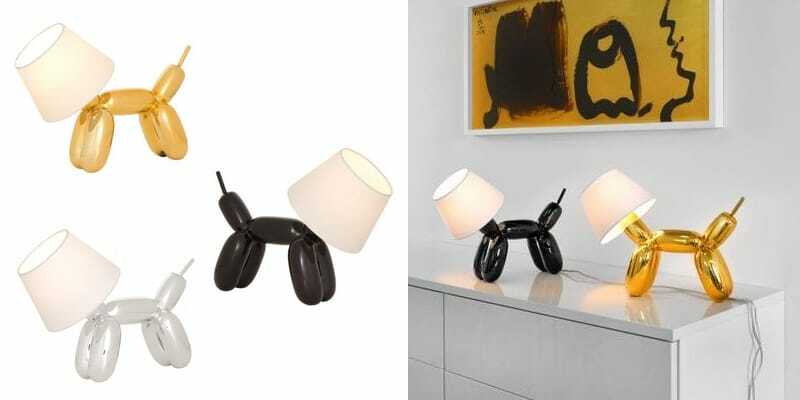 Our newly adopted balloon dog table lamps are just the thing to bring joy to your living space. Available in black, gold and chrome finishes all of which come with a white textile shade and are playfully switched with the flick of a tail! Great for lighting in any lounge or bedroom but an ideal choice for children’s lighting. The Falcon LED ceiling pendant brings a unique modern styling that would be well suited as a feature piece to any living space. The central column houses a 35 watt LED module which makes it very energy efficient product a high output of 2352 lumens (equivalent to about 200 standard watts). Surrounded by angular metallic pieces it builds up a striking structure and allows for a unique lighting effect on nearby surfaces. This piece is available in bronze, chrome and textured acrylic. 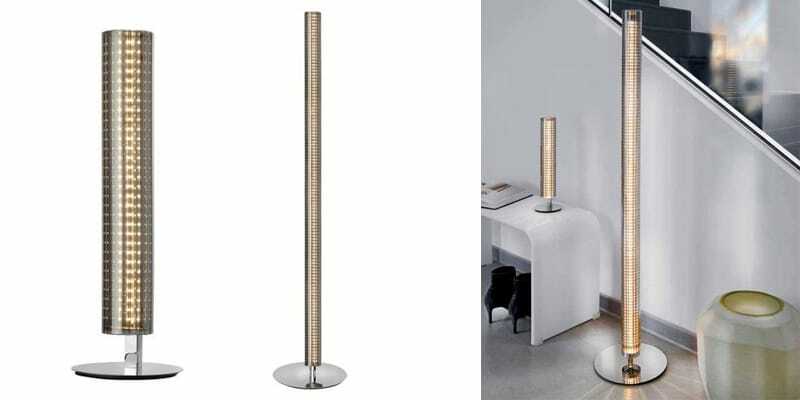 For those who love the futuristic look and yearn for sleek design the LED Column table and floor lamps are a perfect suitor. Both featuring polished chrome finished metalwork and cylindrical smoked glass the LED light sources inside create a sparkling lighting effect. Each operated by a three stage touch dimmer on the top to allow for control over the level of light output these impressive towers can create the right ambience for any living space. We all love convenience and in today’s modern world we are never too far away from our mobile phone. Being caught with a low battery and nowhere to charge is a disaster to many so multi-functional lighting with the addition of smart phone charging is a win. 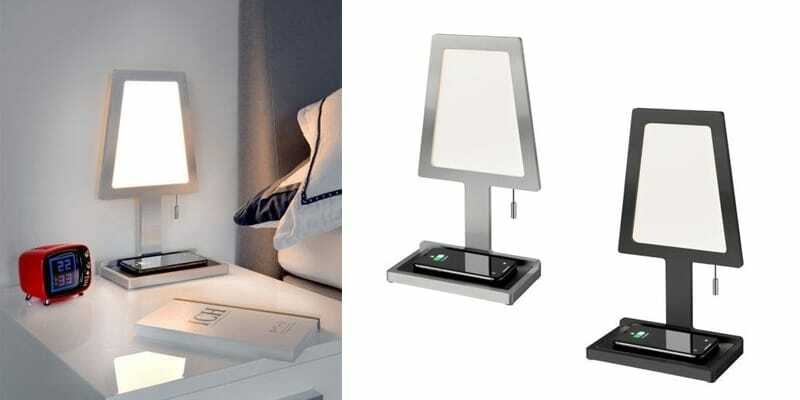 The Charged range of LED table lamps come in a black or aluminium finish and feature a slimline profile with a rectangular base that houses an inductive charger. Simply place your smartphone onto the base and let it charge wirelessly! This would be a great choice for bedside or lounge lighting in a home or hospitality setting. 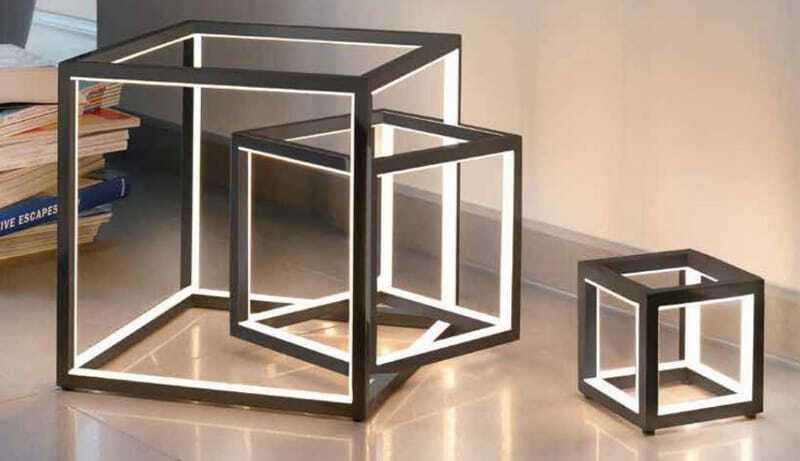 Continuing on the idea of multi-functional the Light Table is an LED floor lamp that also functions as, you guessed it, a side table! 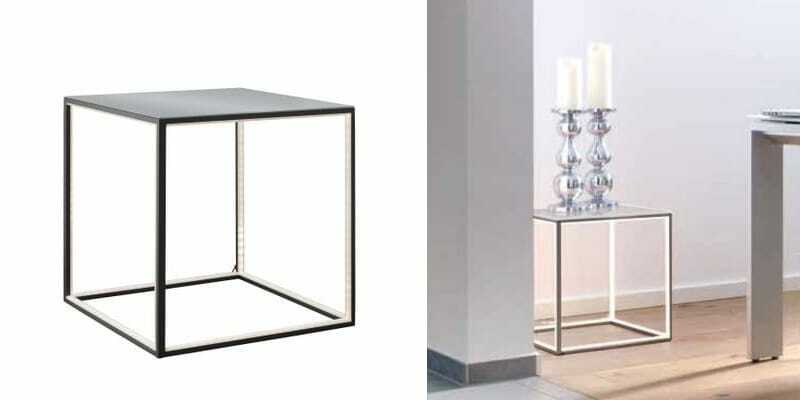 In a classy black aluminium finish with an unobstructed cube frame structure the base houses an LED light source on the inner edges and is finished with a frosted glass top. The LED uses only 12 watts but provides an impressive 1080 lumens which is around 80 standard watts. A great addition to the contemporary lounge or bedroom. If you don’t have a smart phone capable of wireless charging, never fear! There are also lamps available which come complete with a USB charging port ready for instant charging right off the light. 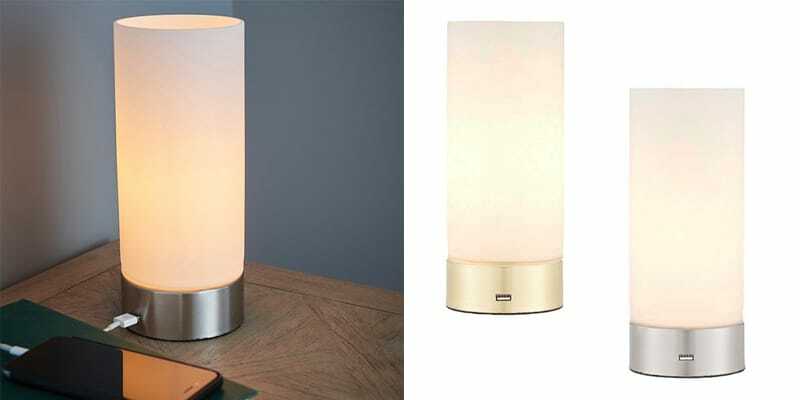 The Dara touch lamp range is available in both brushed nickel and brushed brass with a sleek cylindrical design that would be well suited to the modern lounge or bedroom. This compact multi-functional touch lamp would do well to be considered for hotel and guestroom lighting. We just love the solidity that cube structures provide and the Cubed range are the building blocks to a playful and contemporary interior. Available in three various sizes these LED table lamps can be arranged in numerous ways from stacked to grouped in a nest. You could also use them to highlight an ornament of belonging thanks to their open structure. We hope you’ve enjoyed a preview of some of our latest lighting additions. Take a look through our website to see the full collection!